I have always been a fan of Bill Gates and how he has revolutionised the computer industry by getting a computer in every home and every office. I also have much admiration for Steve Jobs and how he has introduced new technologies that have captured the hearts of new age consumers. Their joint interview all the All Things D conference was one of the most entertaining and thought provoking tech interviews I’ve watched. When Steve became ill, Bill sent him a letter about their life, what they have achieved, being competitors, being friends, and family. 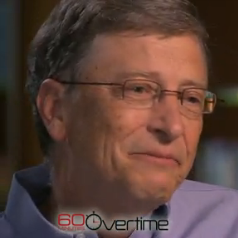 The video touches on philanthropy and Steve Jobs is seen as praising Bill for his philanthropic efforts. Steve goes on to say ‘I think the world is a better place because Bill realised his goal is not to be the richest guy in the cemetery’. It’s worth noting that the Bill & Melinda Gates Foundation was created back in 1994, although since retiring from full time work at Microsoft, Bill has been able to devote much more time to his charity organisation. Currently the organisation has over 1000 employees and so far has donated over $36.2 Billion USD.